This Feature of WeChat Marketing Automation Allows Luxury Brands to Achieve 100,000 New Followers Within One Month. What does B2B Learn From This? What’s the best way for WeChat Official Accounts to attract new followers? It’s not a new topic, but in 2018, JINGdigital has practised a new tactic for this objective. One month after the jointly launched project of the luxury brand and JINGdigital, the number of new followers increased by 100,000 without an increase in cost! – How do you use existing resources to quickly expand your follower base? – How do you deal with the situation where the followers from campaign unfollow very soon? -The retail store has a plethora of visitors, but the potential customer information cannot be effectively marketed. There are many B2B industry exhibitions and each time one is held, new contacts will be added, but the sales cannot covered all of them, causing the source to be wasted. – The geographical location of the followers cannot be distinguished, the purchase intention of the followers and the interest points are not clear, causing the marketing content not be targeted. This customer is a famous Italian luxury brand who recently added high-end women’s wear, men’s wear, shoes, and perfume. Since then, the company has grown, while expanding its business scope to include knitwear, swimwear, jewelry, and men’s fragrances. This brand is also renowned in the world of high fashion for its luxurious fur and handbags. Our Customer has a number of stores nationwide. The most prevalent problem is that in-store guests are obviously potential customers, but they do not necessarily make a purchase every time they enter the store. There are a large number of these customers; how do you connect with them and continue to turn them into loyal customers? For a single customer, the sales staff usually exchanges private WeChat accounts with him/her for future communication. 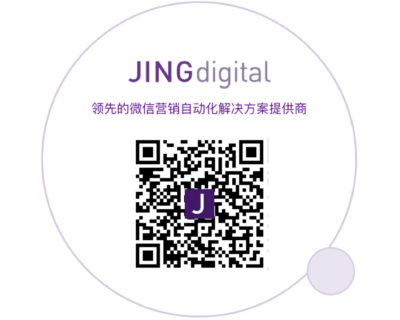 Through JINGdigital Sales Tool, communication is established on base of WeChat Official Account, and 1 on 1 chats between sales and customers. Additionally, using the official micro platform, the customer’s resources will be owned by the brand. The brand’s marketing department will no longer have to be worried about the “privatization” of customers. The retail store is a perfect channel for the brand official accounts to attract new followers. Guests who walk in the store are obviously potential customers, who can be pushed to follow the brand official account by the sales staff at a low cost. In the project, the brand marketing department launched a “contest” between stores,and rewarded the winning store who has attracted most followers and input detail data of potential customers with JINGdigital O2O sales tools. The sales staff can use offline event invitation cards, new products pre-launch, and timely reminders of in-store offers as “bait” to encourage customers to pay attention to Guanwei. Within one month after the brand starting using JINGdigital marketing automation technology, the number of brand official account followers exceeded 100,000 and the accuracy of new fan information reached 70%. The third step is to promote the re-targeting of customized content for followers introduced by different stores (regions). The previously mentioned new follower information accuracy is as high as 70%; how is this accomplished? After entering the store, the guest would follow the brand official account and interact with the chatbot throughout the “welcome journey” to increase the interaction with the brand account. The messages from followers in the dialogue would include their information (i.e. perference, interests…) , which would be stored in the backend as the form of tags. Also the salesperson who has been talking to the guests at a close distance can fill in more detail information of the customer into the Sales system, such as product preferences, style preferences, and more. According to the information automatically acquired by the system and the supplementary information entered by the sales, the guests will be divided into different groups to receive highly targeted content, offline offers from nearby stores, and new products from the guest’s preferred product categories. This process will lead to a first purchase or continuous purchase. Using the JINGdigital-020 sales tool and 1 on 1 conversation, the company can achieve two-way communication between customers and sales personnel in real time to meet the needs of customer service, making customer satisfaction higher. The previously mentioned “O2O sales tools”, “customer journey”, “targeted content “, “customized menu” and other functions, show that the original WeChat function cannot meet the brand’s needs. Please contact your exclusive sales representative to learn how to use the marketing automation technology to tags, segments, targeted content and market followers analysis to achieve more marketing success.